Following recent attendance at the Professional World Motorsport Expo (Cologne) in November and the Performance Racing Industry show (Indianapolis) in December, Xtrac also exhibited at the Autosport International show (ASI) in Birmingham on January 11th & 12th. The 2018 World Rally Championship launched at Autosport International and is the first top level FIA world championship to launch there in the show’s 27-year history. Xtrac has a long and successful history in rallying, supplying the winning driver 21 times and the winning manufacturer 17 times since Carlos Sainz won the championship in 1990 in the Toyota Celica GT-Four with Xtrac’s TX gearbox. At Autosport had two of its latest P1202 R5 4WD rally gearboxes on display, one on the Xtrac stand (E160) in hall 9 and the other as part of a display on Xtrac’s recruitment stand in the Motorsport Industry Association (MIA) Motorsport & Automotive Jobs Fair held on Friday 12th January. The Motorsport Jobs fair follows the successful event held at Silverstone in October 2017. The MIA Motorsport and Automotive Jobs Fair provides a fantastic opportunity for students, graduates, apprentices and professionals, all interested in pursuing a career within the Motorsport and Automotive industries to meet with Xtrac and discuss exciting career opportunities. Xtrac also proudly displayed various products used in many of the top-tier motorsport disciplines for which we have become renowned, including WRC, Formula 1, endurance racing (WEC, IMSA, British GT and many other national series), British Touring Car and TCR. Alongside these motorsport transmissions will be two of our latest ILEV (Integrated Lightweight Electric Vehicle) Transmissions, the P1166 and P1227. 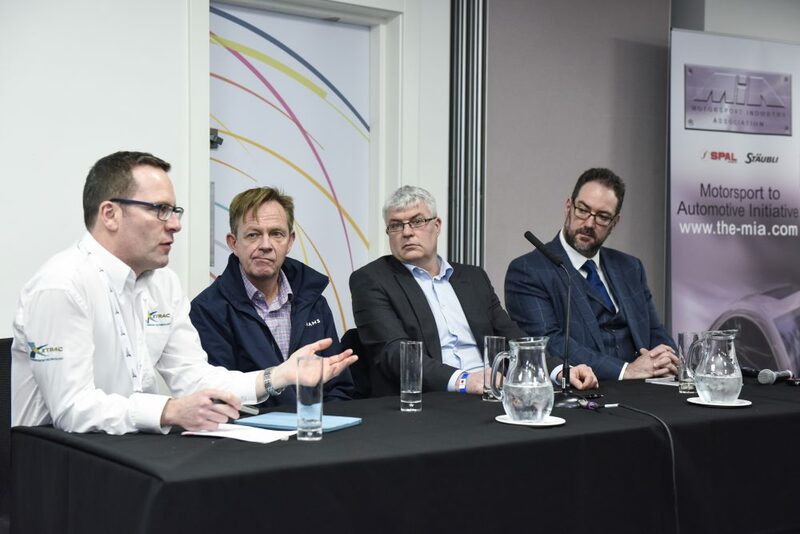 Immediately preceding the ASI show the annual MIA Energy-Efficient Motorsport Conference is was held which explored the current and future energy efficiency landscape spanning motorsport, automotive and high performance engineering. Through our ‘Race to Road’ intuitive, Xtrac are very involved and influential in the area of energy efficient transmissions, especially with products such as the P1166 & P1227 which were on display during the conference, products which have been developed to address the new market requirement for single speed, lightweight and power dense transmissions for high performance electric road cars. Adrian Moore Presenting at MIA Workshop. 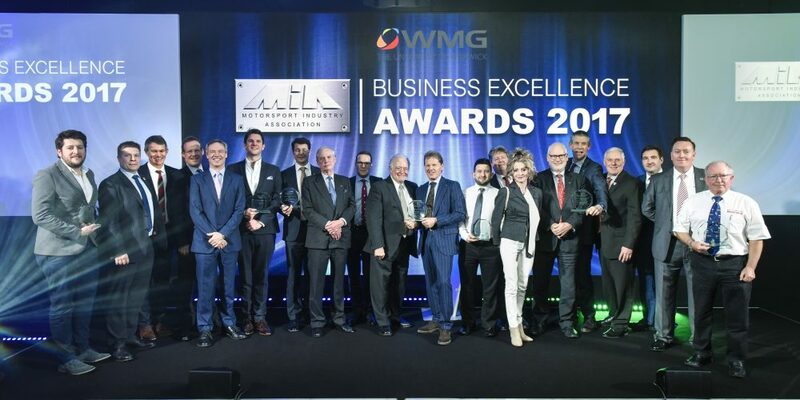 Xtrac Sponsor Business of the Year Award. 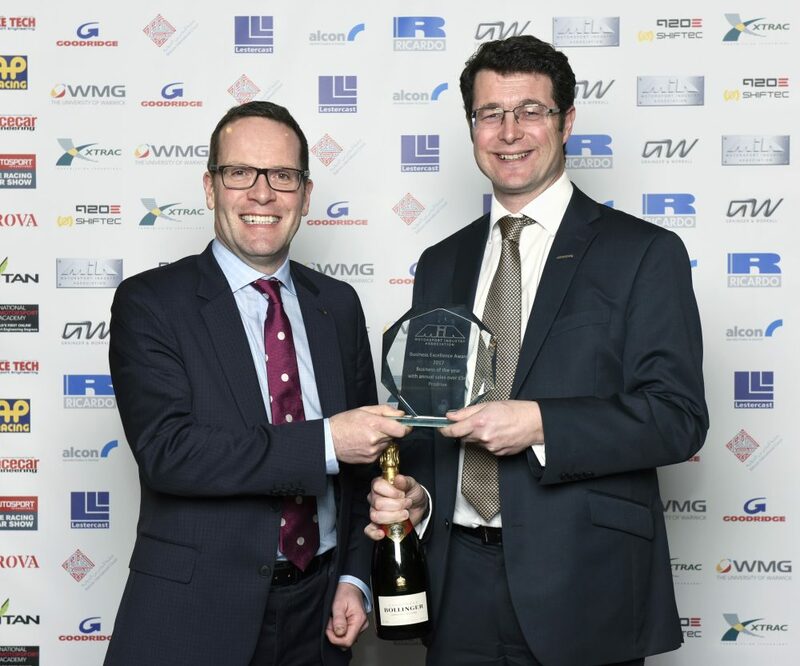 Adrian Moore presents the Business of the Year Award to Tim Colchester of Prodrive.